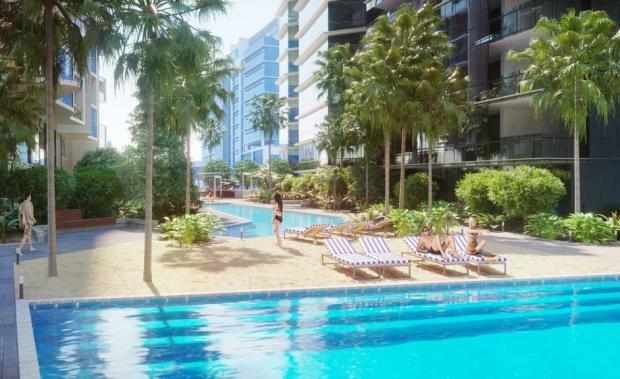 National property group Metro Property Development has sold out the third stage of its $450 million Central Village masterplanned development in Brisbane. Stage 3 (Canterbury Towers) comprises 195 one, two and three-bedroom apartments. The five-tower, five stage project in the inner city suburb of Fortitude Valley has now achieved total sales of nearly $100 million. Two retail tenancies have also been sold to local investors for approximately $1 million. Construction on stage 3 commenced late last year with stage 1 (Cambridge Towers) and stage 2 (Oxford Towers) settling in early 2015. All 195 apartments in stage 3 were sold in five months after being released to the market in the last quarter of 2014. Metro Property Development Managing Director Luke Hartman said the group was well positioned to benefit from the continued upswing in demand in the Brisbane apartment market. “We have seen a marked increase in demand from investors in New South Wales and Victoria where big increases in value have priced them out of the market,” he said. Metro Property Development Co Founder and Marketing Director Ken Woodley said the rental market in Brisbane’s inner city remained very strong with relatively low vacancy and yields of about 5% still available. “Metro has received more than 15,000 rental enquiries for the 1,200 apartments across six inner-city developments that we have completed to date and this provides a good indication of the strength of the inner city market," Mr Woodley said. Metro has appointed PBS as the builder for stage 3 with the tower expected to be completed in the first quarter of next year. Construction of the stage includes a country club facility, open space and an extension of the man-made beach that was commenced as part of the earlier stages. On completion Central Village will comprise five towers and approximately 1,000 apartments in a prime location less than two kilometres to the CBD, near the Valley entertainment and retail precinct and a range of employment and transport hubs. The project is expected to take five years to complete with stages 4 and 5 to be released to the market later this year.